The country will not be able to move forward until it has properly dealt with its past. On June 24, the interior minister of the elected Thai government – ousted the month before in a military coup – officially formed an opposition movement in exile, denouncing the junta as illegitimate and vowing to fight against it. The name of the movement, Seri Thai, echoes a World War 2 resistance movement who fought against the Japanese. It will strike a chord with those who oppose the coup. The date of the announcement – always important to numerically minded Thais – is also symbolic, referencing the anniversary of the 1932 revolution that abolished the absolute monarchy and set out to establish democracy in the country. However, to dismiss the timing of the statement as pure symbolism may be missing the point. In many ways, the crisis that has convulsed Thailand for much of the past decade dates back to this turbulent period and can be understood as part of a long, historical struggle between civilian politicians and royalist elites for primacy – a theme explored in the recently released book “Good Coup” Gone Bad, a collection of essays on the 2006 military coup, currently not available for purchase in Thailand. Rapid social change, displeasure at the privilege given to Siam’s multitude of aristocrats, and the exogenous shock of the great depression laid the foundations for the revolution of 1932. As these things go, the events on June 24 were underwhelming and can be more accurately described as a bloodless coup. However the ease with which power was taken not only obscured the momentous change that had taken place, as seven hundred years of arbitrary monarchical rule were overthrown in a single day, but also failed to signal the eighty years of contention that would follow as a result. The protagonists of the coup – led by civil servant Pridi Banomyong and military officer Plaek Phibunsongkhram – inherited state institutions packed with royalists, many of them blue bloods who could claim lineage to the expansive family trees of past monarchs. Either unwilling or unable to abolish the monarchy altogether, they moved instead to neuter it by placing it under a constitution. However, the aristocrats steadfastly refused to share power with the new “commoner” elites and much bickering ensued. Despite the coup promoters ceding some ground, the conflict eventually culminated in the Boworadet Rebellion of 1933, led by the fiery Prince Boworadet. The elite uprising was put down after heavy fighting in the capital, leaving the royalists considerably weakened. In 1934, unable to accept his new conditions King Prajadhipok left Siam, never to return. He abdicated the following year. In the years that followed, Phibun deserted his ally Pridi, along with the more noble aims of the 1932 revolution, and lurched to the Right, becoming the first of Thailand’s many military dictators. However, what distinguishes him from the others was his distrust of the palace and his efforts to curb its power. From the era of Sarit Thanarat onwards this changed, as the military and the monarchy formed a close alliance that has lasted until today, allowing the palace and aristocrats to expand their influence. The two institutions leaned on each other considerably through the next few decades of Red Scare, student uprisings, deadly crackdowns, public lynchings and the “politicide” of the Thai Communist Party. During the eighties, the appointed premiership of Prem Tinsulanonda – an ex general and palace favorite – brought stability and steady economic growth. The period was a high point for Thai royalism and those on the “yellow” side of the political divide look back on it with nostalgia. Given the weak institution he inherited, the reestablishment of royal prestige during the reign of King Bhumipol was nothing short of miraculous. However, with development and integration into the international community came demands for a fuller democracy, threatening the hegemony of the elites. In 1988, Chatichai Choonhavan became Thailand’s first properly elected prime minster in over a decade, only to be overthrown three years later by a military coup. In what has now become a familiar script, the military move was justified on the grounds that Chatichai was corrupt and presided over a “parliamentary dictatorship.” Since then, only Thaksin Shinawatra has completed a full term in office, although he too was unceremoniously dumped by the military in 2006, one year into his second term. His sister Yingluck, ousted in May this year, is the latest in a long line of elected politicians deemed unacceptable, not only by the traditional elites centered around the palace but increasingly by the Sino-Thai capitalist elites, with much overlap between the two. Online, a plaque commemorating the revolution and the enactment of the first constitution became a popular meme for those opposing the coup, with the image appearing as people’s profile pictures on Facebook. A small group even attempted to mark the anniversary by gathering in the Royal Plaza in Bangkok, where the plaque is embedded in the cement, only to find the area cordoned off and guarded by the military. And in 2012, the Red Shirts held a rally to commemorate the eightieth anniversary of the revolution, with core leader Nattawut Saikua telling the crowd that “despite the events of 1932, very little has actually changed in Thailand and the core of the old system remains, dragging its feet.” He claimed that “an epic struggle was on the verge of happening”. On the other side of the Thai political schism the rhetoric is different. The Yellow Shirts – whose protests between 2005 and 2008 helped bring down two elected governments – wore t-shirts emblazoned with slogans such as “we will fight for the King.” Animated by a toxic blend of ultra-royalism and nationalism, they saw politicians as venal and Thaksin as an existential threat to the monarchy. Their sense of entitlement and righteousness were frustrated by their inability to win at the ballot box and so they advocated a “new politics” in which representatives were appointed not elected. The PDRC – whose six month protest brought chaos and violence to Bangkok, paving the way for May’s coup – are the latest incarnation of the same ethos. Their claims of representing the maha prachachon, or “great mass,” are at odds with their elitist outlook, succinctly articulated by movement leader Chitipas Bhirombhakdhi. In a now infamous interview, the heiress to the billion dollar Beer Singha fortune – and an aristocrat on her mother’s side – said that “many Thais lack true knowledge of democracy, especially rural people.” The proposed solution is an unspecified period of rule by an appointed government, who will oversee vague “reforms” to create an “absolute democracy” free from corruption and vote-buying which, they claim, sullies the current system. Most Thais in the provinces believe the move is designed to take away their votes. Thailand cannot move forward until it has dealt with its past. As in 1932, the advance towards a meaningful democracy once again faces resistance from entrenched royalist elites. Today, however, the struggle is not only between aristocratic and “commoner” elites but has been nationalized to include all levels of a deeply divided society. 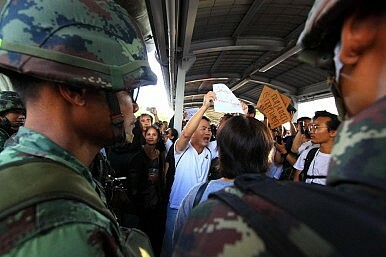 Like the coup of 2006, the recent military takeover has deepened Thailand’s crisis instead of resolving it. This is unsurprising because neither were genuine attempts to break the impasse but were instead measures for the royalists to regain the upper hand. The only way for Thailand to move forward is to hold free and fair elections, respect the votes of all Thais, and ensure that all sides accept the results. If, under the guise of “order” or “reforms,” the royalist junta continue to frustrate people’s legitimate claims of suffrage then the prospects for Thailand look bleak. Any move to disenfranchise Thai voters could precipitate the most serious conflict yet. If this comes to pass then the bloodshed long thought to have been avoided in 1932 may simply have been delayed. James Buchanan graduated from SOAS, University of London and is currently doing PhD research on Thai politics at City University of Hong Kong. The Rice and Fall of Yingluck ShinawatraThailand’s Big Step BackwardsThailand’s Rice Scheme Post-MortemTense Times in ThailandA New Era for Thailand?